Stomach pain can often be eliminated with diet changes alone. Does your gut ever feel kind of funky after you eat? Do you ever feel as though you’re constantly bloated? Does diarrhea or constipation cramp your style? (Pun intended)! Sadly, this is all too common in today’s age, particularly in the United States. That’s why today, we will be reviewing the best gut healing diet plan. So let’s begin with a brief “why.” Why, as an NBA dietitian by day and private practice dietitian by night am I seeing more athletes with gut issues and more chronically ill patients coming in with complaints of constipation and diarrhea? Why Are Gut Issues So Prevalent Today? Our farming practices have drastically changed over the past 60 years and most of it has not been for the better. Food manufacturers have found new ways to preserve the shelf life of many popular foods. Greater shelf life = greater profit. OK, fair enough but what happens when we are unknowingly consuming these processed foods day in and day out? Fatigue, gastrointestinal disturbance, joint pain, sinus issues, chronic headaches, brain fog and more. Mix in a fast-paced lifestyle loaded with stress, environmental toxins, and medication on top of all of this processed food and you have yourself a recipe for health issues, often expressing themselves in the form of gastrointestinal malfunction. We know that almost 80% of the human immune system lives in the gut, so it only makes sense that the food we eat each day directly affects the way our esophagus, stomach, intestines and bowel operate. How Can I Get Rid of My Gut Issues? Good news, there is hope! In fact, the vast majority of us dealing with gut issues can alleviate our symptoms entirely, or at least almost entirely by dietary changes alone. While medications and surgeries have their place in life, the first line of defense should always be food. Not sure where to start? A basic elimination diet is a great place to begin if you are suffering. The reason being that food allergies, sensitivities, or intolerance could be the biggest culprits for the nagging symptoms you are experiencing. If adverse food reactions are a new concept to you, please check out my article explaining the difference between the three. Removing the top allergens can sometimes provide relief for chronic health issues. An elimination diet is the process where specific foods or components of food are strictly removed from the diet for a specific amount of time and then gradually reintroduced so that symptoms can be monitored. It is always best to work with a qualified healthcare professional before beginning an elimination diet. Your healthcare provider will know how long you should remove these foods and exactly which foods should be removed after a complete review of your symptoms and past medical history. 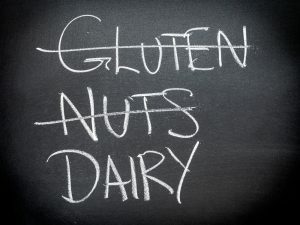 For those of you reading this article who do not have access to professional help, I will teach you the basics of an elimination diet where the top allergens are removed. These foods tend to be the most offensive as they are consumed most often and they are also the foods that are most heavily treated and manipulated when it comes to farming and manufacturing. Before beginning an elimination diet to alleviate chronic health issues, especially those that are gastrointestinal in nature, you will want to create a grocery list according to the recipes that you will be following. Compliance will always increase when meals and snacks are prepared in advance for the week. As mentioned previously, you will want to focus on removing the most offensive allergens: soy, wheat, corn, dairy, egg, pork, peanuts and shellfish. Be mindful of the fact that these ingredients can be lurking as additives in foods that should otherwise not contain any allergens. Look closely and you might find soybean in your salad dressing and milk in your favorite cracker! Begin to map out your meals and snacks for the week. The last thing you want to do is walk around exhausted and starving all day because you did not plan accordingly. Lastly, here are 7 strategies to ensure success when following an elimination diet plan. Breakfast: Power shake: 1 cup unsweetened flax milk, 2 scoops collagen peptides, 1 frozen banana, ½ avocado, 1 tsp coconut oil, 1-2 teaspoons of cinnamon. 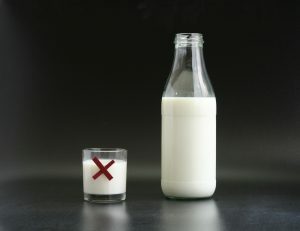 Removing certain allergens such as dairy can be life changing for some when it comes to improving gut issues. In my professional experience, after coaching thousands of patients through an elimination diet, I can say that it takes approximately six weeks for the immune system to “calm down” and “reset” so to speak, but a bare minimum of two weeks strict dietary compliance to see any form of progress. At the end of your elimination phase, it is best to work with a licensed professional in order to reintroduce each food. Ideally, you will reintroduce one new food every 3-4 days (as that is how long it can take to see a reaction). Most importantly, you will want to make sure that you document symptoms, both good and bad, in order to know how your immune system is reacting to specific foods. This will help you better determine a long term eating regimen that works for you. And there we have it folks, an elimination diet to support gut healing. I hope this approach provides you with a new level of energy and health. Cheers to healing and happiness in the new year! Images purchased from shutterstock.com by author. Kylene Bogden is a board certified sports dietitian who has completed advanced training in functioning nutrition. As a former dietitian at the Cleveland Clinic Center for Functional Medicine, Kylene specialized in nutrition for performance while taking into account food sensitivities, gut health and nutrient deficiencies. By creating personalized functional fueling strategies, she has helped to dramatically improve the health of thousands of individuals. Kylene has been quoted as an expert source in publications such as U.S. News and World Report, O Magazine, Time, Prevention, The Huffington Post, CBS.com and Women’s Health Magazine. Additionally, she has been invited to speak on the local, regional and national level. Kylene is currently an NBA dietitian and creator of the functional sports nutrition blog: fwdfuel.com. 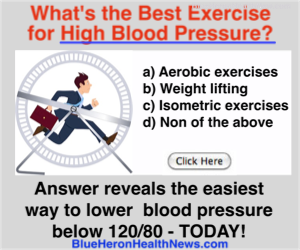 This entry was posted in Good Health, Longevity, Quality of Life, Specialty Diets, Weight Loss. Bookmark the permalink.